◎ Presenting our forecast for the Central Military Command reshuffle. Mao Zedong once quipped that “political power grows out of the barrel of a gun.” Acknowledging this symbiotic link between military and political power, the Chinese Communist Party (CCP) has always sought to keep its military under tight control. Not surprisingly, the dialectic between military and political power became problematic in an authoritarian system that has never quite resolved its own political legitimacy. The CCP’s reliance on absolute authority to handle crises has led to a situation where Party leadership can be held hostage by those with power over the troops. For instance, as General Secretary, Hu Jintao had very little influence over military matters while Jiang’s political faction controlled the People’s Liberation Army (PLA). Consequently, Hu became little more than a figurehead. Aware of Hu’s fate, Xi Jinping sought to purge the Jiang faction from the military ranks after taking office in 2012. Through an anti-corruption campaign, Xu Caihou and Guo Boxiong, two military vice chairmen and Jiang faction members, were investigated on corruption charges. Xu died of bladder cancer before he could be prosecuted, while Guo was sentenced to life imprisonment. Many other Jiang faction members who held prominent posts in the military were also purged. In 2015, Xi launched sweeping military reforms that included command restructuring and army group reorganizing. As a result of these reforms, Jiang faction networks inside in the military were cleaned out or weakened. At the 19th Party Congress, Xi will strive to keep the military (and hence the CCP) under his thumb by appointing personnel he is more inclined to trust to China’s top military body—the Central Military Commission (CMC). This CMC comprises of one chairman, two deputy chairs, and eight members. Going by the CCP’s “(sixty) seven up, (sixty) eight down” retirement norms, five members are slated for retirement, including one deputy chair and four members. Former PLA Navy commander Wu Shengli was replaced from his post in January, while six other CMC members were removed from their office between August and September. 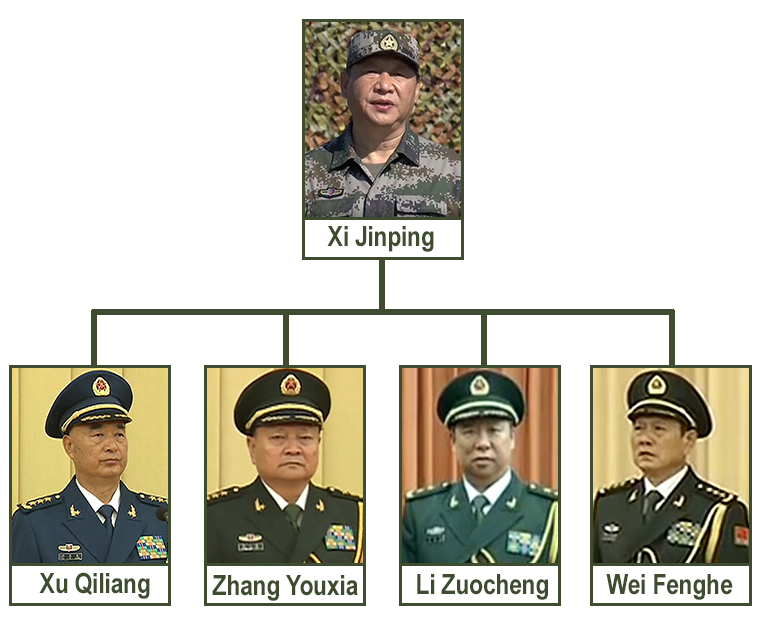 The seven generals who succeeded the outgoing CMC members received their promotions after Xi Jinping took office. Going by retirement procedure, defense minister Chang Wanquan should be stepping down in March 2018. Abolishment of the PLA’s four General Departments and seven military regions. Reorganization of the 15 CMC departments and five theater commands, as well as ground forces, strategic support force, and missile force. Reshuffling most of the People’s Armed Police (PAP) chiefs of China’s 31 provinces and regions. This round of personnel reshuffle mainly took place in the various theater commands. A new guard of generals were appointed as theater commanders, while many Jiang faction generals were made deputies to CMC department heads. Personnel from the four General Departments were retained in the new departments to ensure a stable transition. At least 19 generals retired early, including PLA Navy commander Wu Shengli. Later, two of the retired generals were reportedly placed under investigation with one investigation made official. 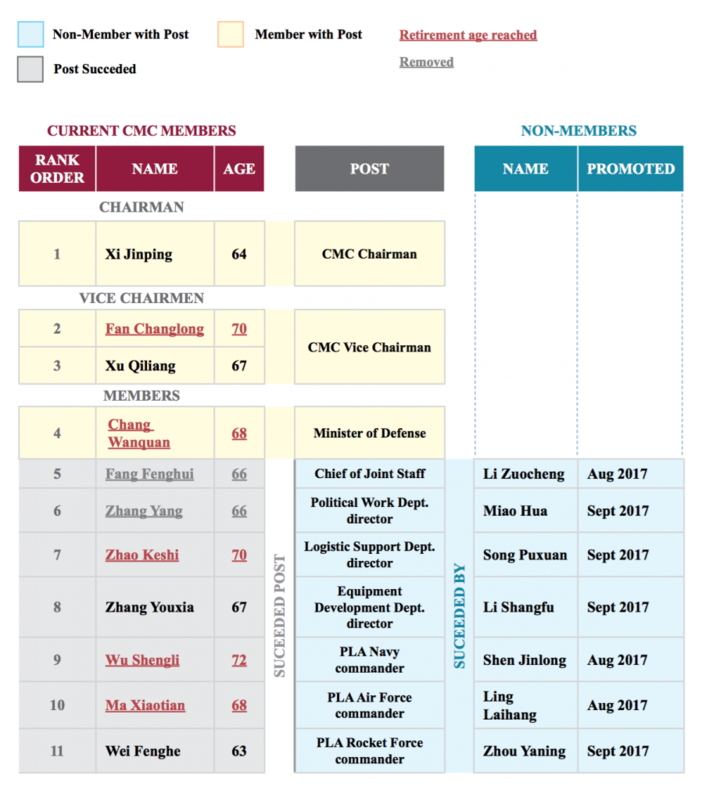 This round of purges came after Xi Jinping was declared CCP “core” leader at the 6th plenum, and resulted in at least 6 of the 51 military organs subordinate to the CMC being left vacant for months. The PLA’s 18 army groups were reduced to 13 and given new unit numbers. Twenty-six newly appointed army group commanders and their political commissars were given 24 hours to take up their posts. This reorganization and personnel change appeared to disrupt entrenched power networks inside the various army groups. Chief of Joint Staff Fang Fenghui and Political Work Department director Zhang Yang were removed from their post. Aside from defense minister Chang Wanquan, the remaining seven CMC members were removed from their post. The heads of several CMC departments—Joint Staff, Political Work, Logistics Support, Equipment Development—were replaced. The commanders of the PLA Ground Forces, Navy, Air Force, and Rocket Force were replaced. In 2017, three theater commanders and three theater political commissars were replaced. The Central Theater commander position is currently vacant. Only five CMC department heads are still in office. The heads of the other departments, commands, and schools have already been replaced once. Four CMC-controlled institutions are either without a head or the appointment of a new head hasn’t been made public. Xi Jinping has overseen sweeping changes to the military’s command system, armed services, and organizational structure. We anticipate that Xi will make major changes to the CMC so that it is better suited to the post-reform military command system. 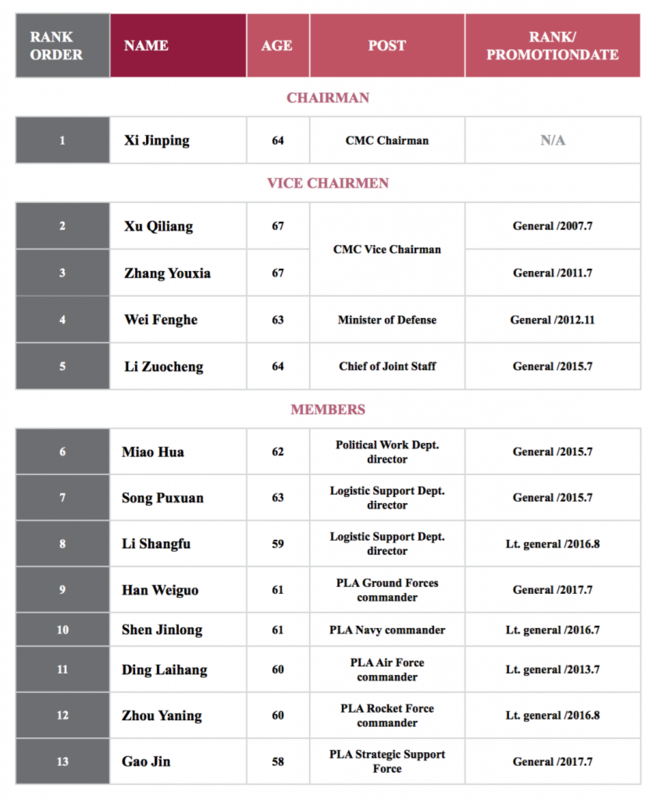 Military power will be consolidated in the CMC Chairman position. Since late 2014, Xi Jinping has been promoting the idea of “CMC Chairman Responsibility System,” a contrast from the old “CMC Vice Chairman Responsibility System” overseen by Jiang faction military elites Guo Boxiong and Xu Caihou. Xi is likely looking to avoid Hu Jintao’s experience with the military, and will definitely seek to centralize power in the chairman position. CMC vice chairmen’s power will be diluted. Xi has reorganized the vice chairmen-controlled CMC General Departments from four to 15 smaller departments, “flattened” the command system, and separated the chain of command into an operational chain and an administrative chain. Future vice chairmen will have to share responsibilities and power amongst themselves, and carry out mutual checks and balances. Dilute the power of CMC members and create more mutual checks and balances. Create a more suitable arrangement for the CMC to govern the reformed military command system and the newly added armed services. Xi will likely avoid appointing Generals and Lt. generals who were promoted before his tenure to the CMC. According to military promotion norms, CMC vice chairs and members have to hold the rank of General. Typically, officers who are promoted to General rank have to serve as leading commanders in a theater command or similar position for at least two years and hold the Lt. general rank for no less than four years. The only General in the current CMC who was promoted by Xi is Gen. Wei Fenghe. The rest were promoted under Hu Jintao, and had connections to the purged Jiang faction CMC vice chairs Guo Boxiong and Xu Caihou. Out of the 51 heads of military departments, theaters, armed services, schools, and other organs under the CMC, 34 were promoted to the rank of General (13) or Lt. general (21) after Xi took office. Xi should be choosing future CMC vice chairs and members from the pool of generals he promoted. Many of the new Generals heading the 51 military organs under the CMC’s command had received exceptional promotions under Xi Jinping. All the new Lt. generals are officers who were stuck at the Maj. general rank for 6 to 10 years. The average age of the 13 Generals promoted under Xi is 62, with the youngest at 58. 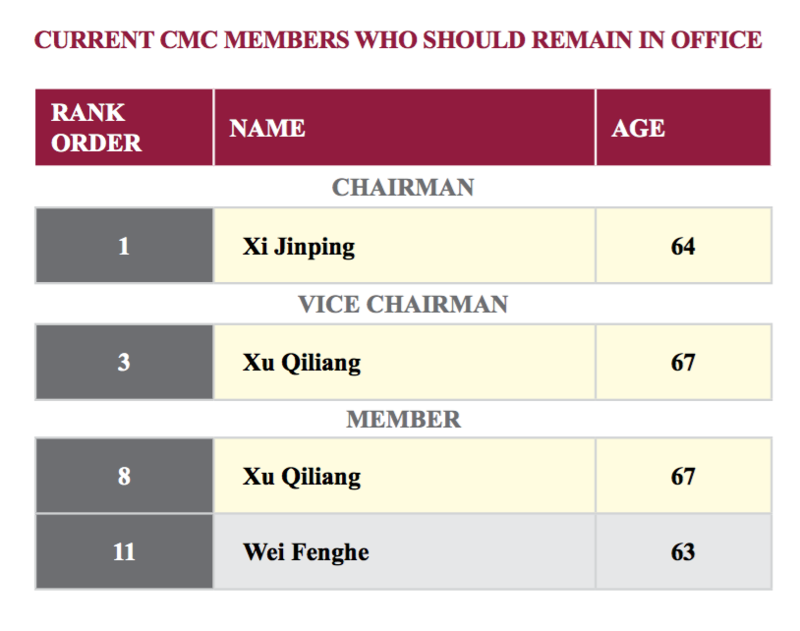 The incoming CMC will be based on the “CMC Chairman Responsibility System,” so there is an increased probability of Xi appointing four CMC vice chairmen to serve as check and balances to each other. 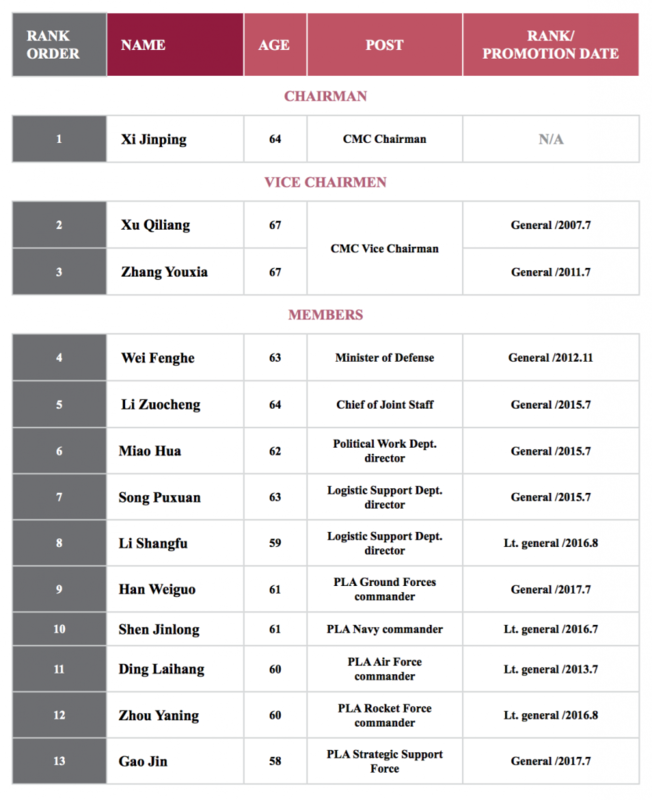 Under the former CMC vice chairman set up, one vice chair would oversee military affairs while the other would take charge of political work. Commanders of the newly added military services are likely to be made CMC members. Cast aside high-ranking generals who are associated with the Jiang faction or the princelings (children of revolutionary leaders). Xi is also keeping a watchful eye out for would-be dissenters, and could frequently reshuffle certain posts to prevent dissenters from building up influence over time. Hand exceptional promotions to generals who were somewhat distant or marginalized by the Jiang faction, and then pick these generals for top office. Promote young officers from the military academies who are well-versed in modern warfare theories.